Last week sprawled over several different types of auctions. This week my curiosity is focused on two specific auctions. 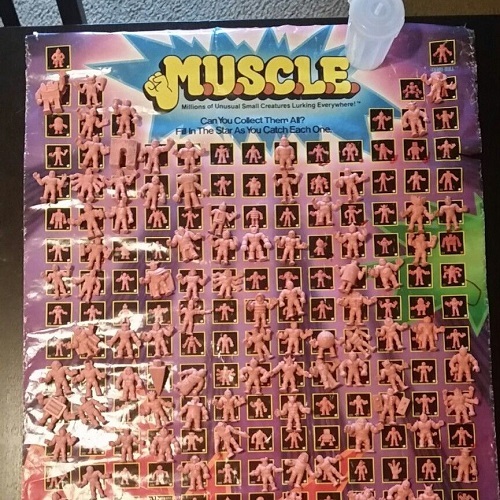 The first, Vintage 1985 M.U.S.C.L.E Muscle Men Poster, 126 figures & bin Original Y.S.N.T, grabbed my attention because of last week’s SUS. It felt like we hadn’t seen a poster and figures listed in quite some time. And, if we had, it had an opening bid of $499.69. The figures seem fine and the empty can is inconsequential. But that poster is in atrocious condition. It is not an upgrade poster. It is only a hungry-desperation poster. It looks to be in such terrible condition I wonder if the person that purchases the lot even cares about it. I’m not suggesting they throw it out, but this thing isn’t getting framed. At best, it might stay folded up and sit on a shelf; maybe under a few displayed M.U.S.C.L.E. items. I would be shocked if this auction gets two bids. I think the winner is the guy that bids the opening price of $99. The second auction, M.U.S.C.L.E. 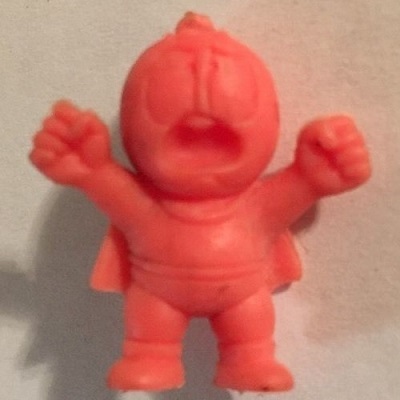 Muscle Men #189 MITO Kinnikuman SALMON CLASS B (Damaged), is one that really makes me wonder – but not for the reason you probably expect. I’ve never been uptight about figure condition. Faded. Stained. Broken. Initialed on the feet. I don’t care. I have always wanted to add a figure I don’t have. I know lots of other people feel differently. They care deeply about the condition of the figure. I think it’s much easier to be flexible about figure condition when the figure is desirable. I think most collectors would be very flexible if they saw a Purple #153 that had been chewed by a dog for $3. But what about a Purple #208 missing an arm? Just about every collector would say the figure has become custom fodder or, a little painful to admit, garbage. That’s why I find this damaged #189 fascinating. He has a $0.99 BIN. Is it worth it? What if I was just starting? What if I didn’t have friends on LRG? What if I couldn’t find someone to buy from or trade with for the figure? The only other single figure listing for a Salmon #189 is $34.95. If I don’t have the support network do I buy it damaged for $0.99? If 2002 Chad saw this figure, and needed it, then I think he would buy it. I couldn’t argue with him. I still think it’s better to have a placeholder instead of nothing. The price is probably steep for a figure in that condition, but $0.99 for a figure certainly isn’t the end of the world. If you needed this figure, would you pay $0.99? Why? This entry was posted on Thursday, February 23rd, 2017 and is filed under Auction Watch, UofM News. You can follow any responses to this entry through RSS 2.0. You can skip to the end and leave a response. Pinging is currently not allowed. i would NOT purchase that figure, because my personality is one that in my mind would be this nagging….i need to replace that damaged figure. then, i’d have shelled out money TWICE for the same figure, which i try to not ever do. i apply this to all toy lines i collect, even though my m.u.s.c.l.e. days are long gone. just one dude’s opinion. then, i’d have shelled out money TWICE for the same figure, which i try to not ever do. yes. if i were still collecting, and i wanted a poster for my collection i would wait, until i saw THE poster for my collection.